Photos by Liz Martiniak ©Liz Martiniak 2003; all rights reserved. 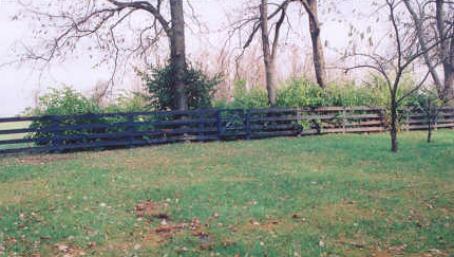 MINEOLA STOCK FARM on Bryan Station Road in Lexington, Kentucky, was established and owned by Kentucky "hardboot" E. Gay Drake, a thoroughbred breeder who usually sold his youngsters. One of the fillies he bred and raced was a 1942 filly, Swoon, who won five of her 23 races. She was retained as a broodmare at Mineola, and bred six winners from six starters for Drake. Her fourth son, DOGOON, earned $65,955 as a juvenile in 1954. Her next foal, SWOON'S SON, was a very good runner, just missing the championship honors at ages 2, 3, and 4, and earning almost one million dollars. Two of his best races were at age five, when he won the Equipoise Mile, carrying 129 pounds, beating Bardstown, Clem, and Round Table, and the Hawthorne Gold Cup shortly thereafter, when, carrying 123 pounds to Round Table's 126, he se the pace for a mile, pushing Round Table to set the track record at 1:59-4/5. Dogoon and Swoon's Son, both by The Doge, made their sire's reputation. SWOON also died at Mineola, on April 23, 1953. Mineola's operation was assumed by Drake's daughter, Helen Drake Jones and her husband, Jack, after Drake's death. The farm produced many stakes winners, the best being the courageous English champion Henbit, winner of the Epsom Derby Stakes; his dam, CHATEAUCREEK, is also buried here. Mrs. Jones died in November of 2003; her son, Jack, Jr. served as legal counsel and general manager of Fasig-Tipton Kentucky. --P.E.